Optogenetics allows us to switch cells on and off using light. The term ‘optogenetics’ is easiest to understand when broken down into its two important features: ‘opto’ meaning light, and ‘genetics’ referring to DNA and our biological makeup. 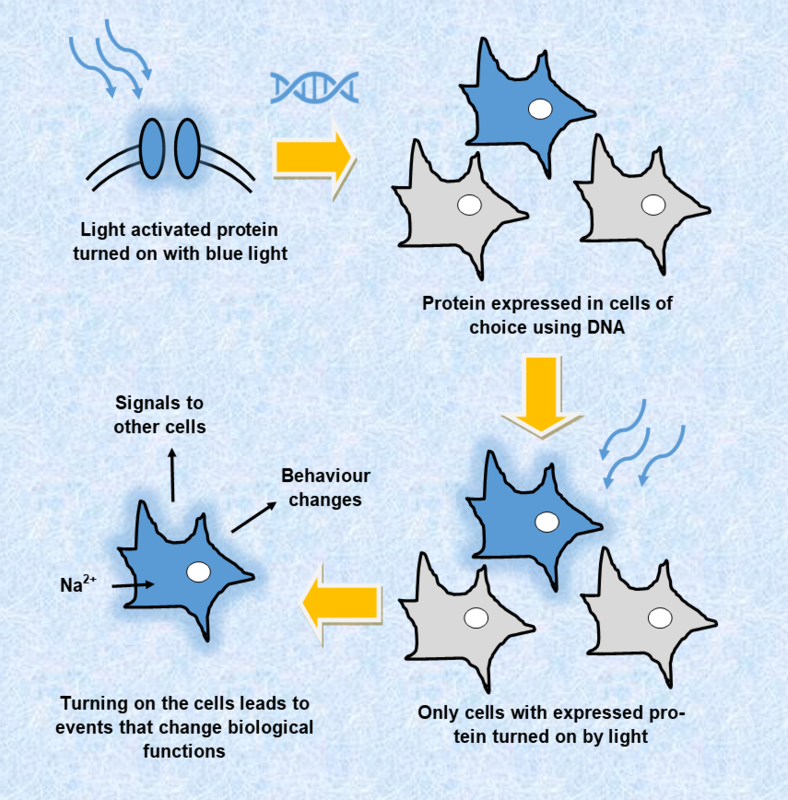 Different techniques associated with optogenetics all have the common goal to use genetic changes to stimulate a biological system – whether that be a single cell or a network of cells – using light. Commonly, drugs and electrodes are usually used to probe biological responses within cells, but drugs always have side effects that aren’t specific to one cell response, and electrodes require invasive, less selective means of stimulation. Enter light and its many different wavelengths. Only cells in your eye and associated pathways have the ability to be stimulated by light naturally, so what if we genetically changed, say, a heart cell and one of its cell responses can be triggered by light? This enables researchers to see what that one cell response does without stimulating anything else (as a drug will activate many different processes) or causing damage to the cell. How is this possible? Due to advances in genetics over the past several decades, we can now design DNA and pop it in a cell of our choice, enabling the cell to use the DNA and make the protein required. Using these techniques, researchers have taken a group of light sensitive proteins, called opsins, and applied them to many different cell types. The first opsins used in this way came from bacteria, but the opsin proteins from our eyes have also proved useful. Different opsins cause changes in different molecules within cells. Some, such as channelrhodpsins, allow electrically charged sodium or chloride to enter into cells when they are stimulated by light, causing electrical stimulation as seen in nerves. Others can change the levels of calcium, or even ‘energy molecules’ (eg. ATP; adenosine triphosphate and derivatives) which can cause all sorts of occurrences such as movement, growth, gene regulation, or communication with other cells. Another useful part of optogenetics is that the opsin proteins are activated by different wavelengths (colours) of light. Some are sensitive to blue light, others to yellow, or red. You could, for example, increase sodium (positive charge) in a nerve cell with blue light, causing it to be electrically switched on, and then turn the cell off using yellow light, which causes chloride (negative charge) influx. Although the application of optogenetics is currently not possible in a human patient due to obvious genetic manipulation ethics, the level of specificity and control of timing will make optogenetics a crucial tool in identifying treatment targets for medical purposes. It is also perhaps possible to make our treatments light-activated, such as a development of photoswitchable drugs that only work when they are lit up by a certain colour of light. This would make it possible to again target a single, specific area of the body and potentially decrease side effects. Optogenetics is providing an enlightening path towards our understanding of biological processes, one colour at a time.